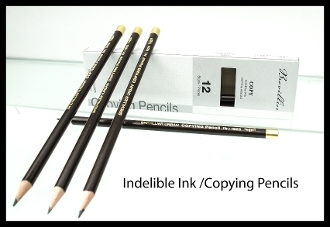 Successor to Sanford NOBLOT Ink Pencil 705, called "A Bottle of Ink in a Pencil." The lead writes as if it were ordinary smooth dark grey graphite lead, but it is indelible. In fact, it is a seductively smooth-writing "graphite" pencil, and you must be careful to separate it from regular graphite pencils. If you write very lightly and erase very carefully with a vinyl eraser in a dry environment, the markings will erase. The indelibility is due to the dyeing of the surface written upon, which is "fixed" by writing firmly, by the rubbing action of mechanical erasure, and further intensified by dampening or exposure to humid environments (your "hot, foggy" breath close to the markings will do). To assist you in keeping this lead away from anything you do not want permanently marked, one end of the pencil is capped with a metal ferrule, and we supply a point protector with each pencil. This lead does not break as easily as our Veritas indelible pencil leads. The aniline dye component weakens the lead slightly as compared with usual clay/graphite leads. We suggest sharpening it to a short point, rather than a long one. The body is round, which assists you in continuously turning the pencil during use to keep the lead pointed.